Do Your Students Struggle With Math Facts? - The Resourceful Room! I don't know if any of you find your students struggling with math facts but I sure do! I know that the foundational skills need to be in place for my students to be able to concentrate on higher level thinking so we spend most of our time trying to learn basic math facts to mastery. I am always looking for new resources to help me get them practicing. You know, it's got to get their attention, and keep it! It's got to change up every once in a while! We can't just drill flash cards everyday, it's been tried and it really didn't work!! So on my search for great resources I found one that has really helped my students and I wanted to share it with all of you! Laura Candler's Mastering Math Facts! I love this book! It is filled with great activities and lessons to help students master facts. It is aligned to the common core, and it's FUN!! The activities include hands on ways to practice facts, step by step lessons, and lots of variety, so your students don't feel like it's drill and kill, but you are still practicing basic facts every single day! Activities like hula hoop, fish tank, and egg carton multiplication are fun and functional. It begins with assessments so you can see just where your students are in their understanding, it teaches students to link addition to multiplication, and uses real world situations for applying newly acquired skills. It includes a motivational system for tracking facts mastered and rewarding students for their hard work. These can be individualized for each student or used with your whole class. There are several options so you can choose what works best for your students. The assessments are great! I love the variety here too! You can use the one minute timed tests that I've traditionally used or use a fill in the missing number assessment, mini math quizzes for quick review, and even a white board review that could be done as a center! I am so excited about using this with my students in the fall! I know it's made a difference already and I can't wait to continue to see my students master their math facts! 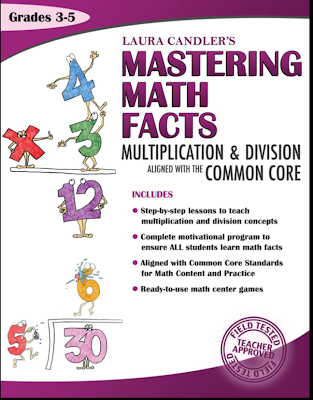 For more information on Laura's book check out the website Mastering Math Facts! There is a great little video you can watch and more information about how the book aligns to the common core. You can order the book from the website in PDF form for easy printing, if you purchase the print edition you get the PDF for free. You can also purchase the book through Amazon, just click on the picture above! I know you will love this resource as much as I do so go check it out!! Aww, wishing there was a K-2 version.